As we reported earlier, the all-new third generation of the Volkswagen Touareg has been unveiled in Beijing. The new car is 77mm longer, 44mm wider but 7mm shorter than before. The exterior styling has been completely revised according to VW's latest design language seen in Indian market cars like the Tiguan-the merged front headlight and grille combination being a standout feature. The car will be powered by a range of engines which includes a 3.0 V6 diesel engine in two states of tune, 286PS and 600Nm, as well as with 232PS and 500Nm. A 3.0 V6 petrol with 335bhp and 332lb ft. and a 415bhp, 664lb ft 4.0 V8 diesel will be offered in some markets. The 362bhp plug-in hybrid version will arrive later in 2019 with 600km range. The car shares its MLB structure with the likes of the Audi Q7, Lamborghini Urus and Bentley Bentayga. This saves the Touareg 106kgs and improves it dynamically. Prices for the new Touareg will start from GBP 50,000 (Rs 46 lakh) excluding taxes and duties. An 8-speed automatic and 4WD with various drive modes will be standard across the range. New tech includes rear-wheel steering, roll stabilisation, adjustable air suspension, a thermal imaging camera to detect obstructions at night, a head-up display; and the ability to steer, accelerate and brake up to 60 kmph. The interior will see a major revision with it now getting a 12-inch digital instrument display and a huge 15-inch touchscreen mounted on the centre stack. These will work in tandem to replace most of the earlier car's physical buttons. The interior is better finished with wood, aluminium and high-quality plastics used throughout. The last generation Touareg was sold in India between 2012 and 2014 before being discontinued. 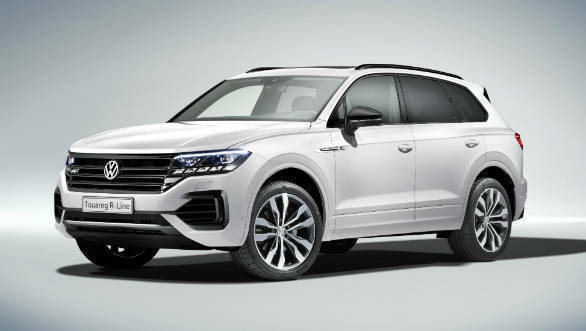 It is not known if Volkswagen will be bringing this model into the country but given that the full-size luxury-SUV segment has seen good growth in the country recently, the Touareg could be a viable cut-price alternative to cars like the Range Rover Sport, Porsche Cayenne and Mercedes GLS-Class.